The structural patterns that results from the translation of the Quran are some of the issues that have been widely studied (El-imam, 2013; Al-Amri, 2015). 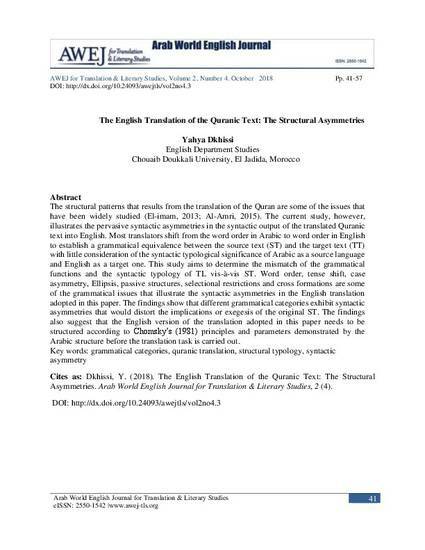 The current study, however, illustrates the pervasive syntactic asymmetries in the syntactic output of the translated Quranic text into English.  Most translators shift from the word order in Arabic to word order in English to establish a grammatical equivalence between the source text (ST) and the target text (TT) with little consideration of the syntactic typological significance of Arabic as a source language and English as a target one. This study aims to determine the mismatch of the grammatical functions and the syntactic typology of TL vis-à-vis ST. Word order, tense shift, case asymmetry, Ellipsis, passive structures, selectional restrictions and cross formations are some of the grammatical issues that illustrate the syntactic asymmetries in the English translation adopted in this paper. The findings show that different grammatical categories exhibit syntactic asymmetries that would distort the implications or exegesis of the original ST. The findings also suggest that the English version of the translation adopted in this paper needs to be structured according to Chomsky’s (1981) principles and parameters demonstrated by the Arabic structure before the translation task is carried out.